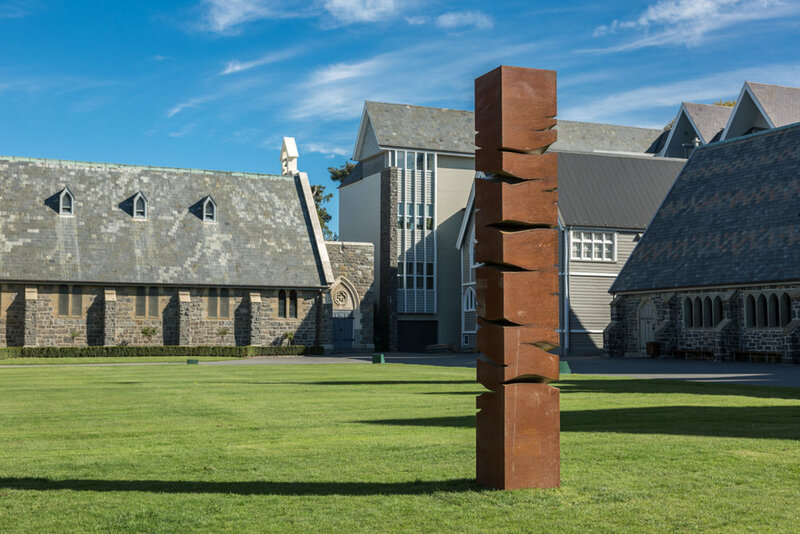 Aucklands-based David McCracken contributes a suite of works for the Season; the first is Portrait of Mass Ascending in Christ’s College Quadrangle. The work reflects the artist’s keenness to interrogate and transform pedestrian materials and objects into commanding and curious sculptural forms. Portrait of Mass Ascending pushes the form of a vertical column, which has a long history in the language of sculpture, and public sculpture in particular. This one appears to be reaching upwards, with fissures emerging as its mass stretches, as if it were composed of soft clay. 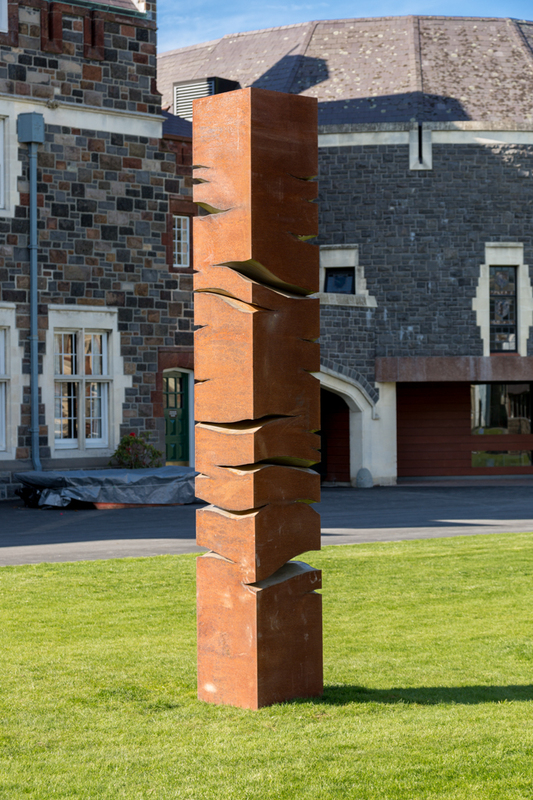 This is illusory, as the sculpture is made from very hefty and rigid materials, welded corten and stainless steel. The ‘portrait’ in the title strengthens the reference to a standing human form, although the appearance of the work is abstract. McCracken is a highly skilled maker, intrigued by exploring the distinct properties of metals, and properties of geometry and scale. David McCracken is a sculptor based in Auckland. He began sculpting in his teens, followed by working in a variety of jobs including boatbuilding and construction where he gained skills with glass and carbon fibre, steel fabrication, welding and woodwork. McCracken has also been involved in the perfroming arts including designing and making sets and props for theatre, dance and film production. McCracken saw the potential of steel fabrication for quickly producing large set pieces and at the same time began making sculpture from readily available and inexpensive scrap when he could afford little else. He furthered his metal fabrication skills to include aluminium, stainless steel, titanium, and corten steel and began casting in bronze and stainless steel. In 2000 he had his first solo exhibition entitled Fabrications at the McPherson Gallery and exhibited an inovative floating installation in Lake Pupuke, Auckland at the Beecroft Sculpture exhibition, marking the beginning of a number of floating sculptures. In 2001 he was shortlisted for the Wallace Art Awards and showed H2O2 at McPherson Gallery as well as a number of private commissions. By 2003 he was sculpting full time, continually developing and adding to his vocabulary of systems and continuing to try new techniques such as hydroforming steel into complex compound forms with hydrostatic pressure, or driving over sheets of steel with a vehicle to create curves. He continues to experiment with water born sculpture and is developing systems for large scale land-art installations. 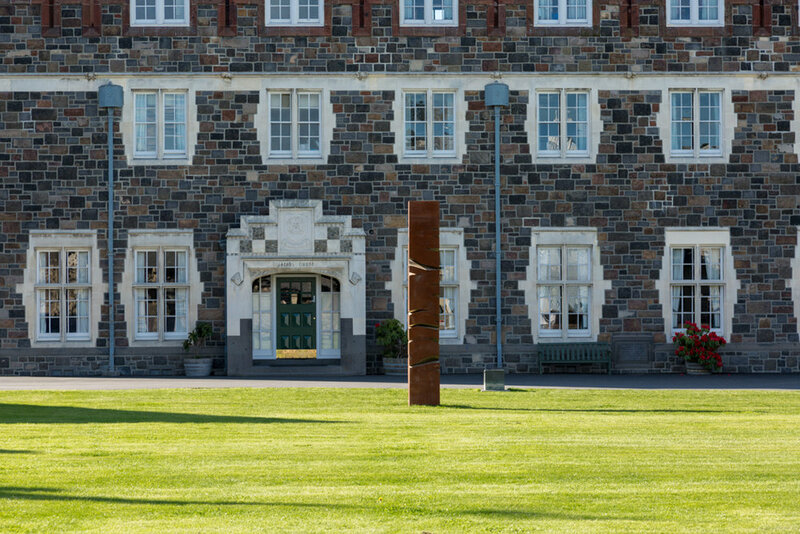 McCracken has exhibited widely in outdoor exhibitions including Sculpture on the Gulf (Waiheke Island) and Sculpture by the Sea (in Sydney) and has received a number of awards for his work. He has commissions in New Zealand and internationally and has been showing with Gow Langsford Gallery, Auckland since 2010.